Created Chick Fries and sold them to women for more money than regular Chicken Fries to teach people about the Pink Tax. We even made now this. We were featured on Fox News and Now This. We remade the classic Budweiser Whassup! commercial with a special appearance by Burger Royalty. It was featured on the Today Show as well as many other news outlets. 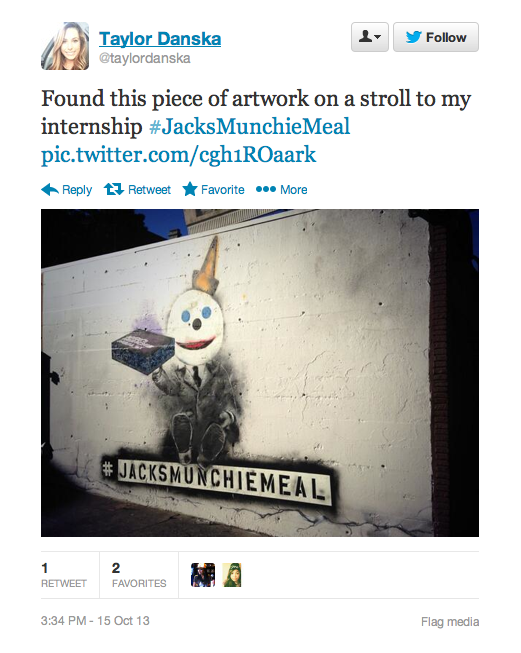 I had the privilege of working on some of the last great Jack in the Box work at Secret Weapon. The most fun I've had in my career, I learned to concept and write like if it was a comedy series, and honed on improvisational skills. We designed Banksy style murals and hired graffiti artists to do their own takes on my original design around LA, SF and SD. They were a huge hit. I was in charge of ampm social and managed a Junior Team, I started pushing the envelope, making stuff out of candy with my genius partner Annie Elliott. 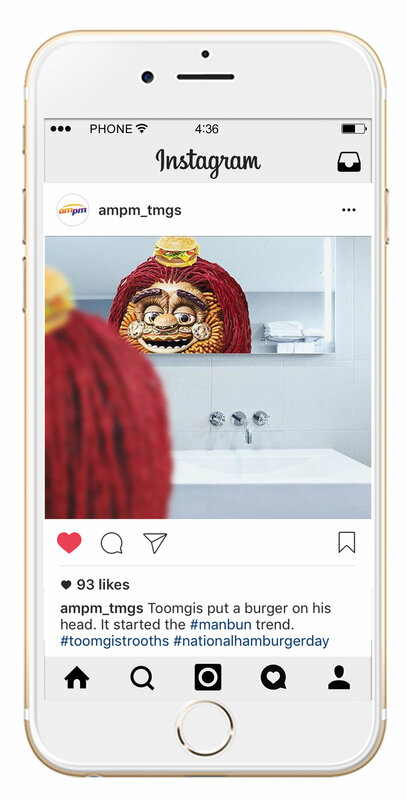 It all came together in the birthing room of the monstrous creation of Toomgis giving him life on Social creating his own snack-themed biography with funny/topical posts called "toomgis trooths" making fun of things like Ben Carson and man buns. We also created the Toomblr. his own blog. 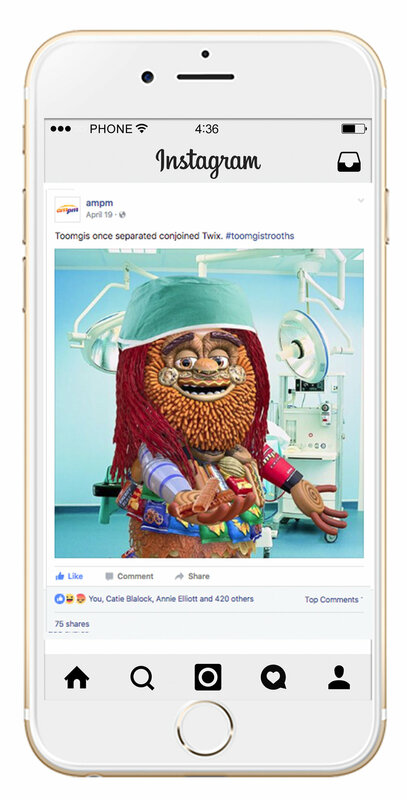 Toomgis just turned a year old! Cannibalism, who doesn't love it. It just seemed logical to use Mr. Potato Head as the spokesperson for Lay's. Worked with the genius Anthony Brooks on this, and after a year of testing and many false starts we were told they were making our spot. Mr. Potato Head is still Lay's Mascot. I was part of the team charged with bringing the hit "Do Us a Flavor" promotion to the US. We lost the battle on the spokespeople, but we won the battle on letting the trolls make up trolly potato chip names. And we are getting a treasure trove of comedy each year. Elite Daily, US Magazine, Popsugar, Creativity, etc. The Got Milk? campaign, another dream come true being able to work directly with the man Jeff Goodby on a classic campaign, and almost destroying it with a very controversial campaign. We got in trouble, but ultimately it was for a good cause. Informing women of the scientifically proven relief milk causes to symptoms of pms.